Our research group investigates the surface properties of transition metal oxide (TMO) over a range of dimensions, from nano-scaled particles to macroscopic single crystals. We particularly enjoy trying to create new materials with unusual cation oxidation states, chemical environments or nano-scaled features. A range of synthetic and experimental techniques is used to develop TMO materials with improved catalytic, magnetic and electronic characteristics. 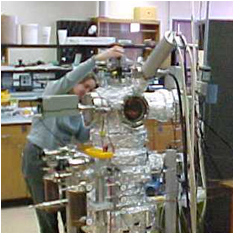 Present experimental techniques include x-ray photoelectron spectroscopy (XPS), Auger electron spectroscopy (AES), secondary ion mass spectrometry (SIMS), x-ray diffraction (XRD), x-ray absorption fine structure (XAFS) and electron microscoies (TEM, SEM). Figure 1. Sarah collecting XPS data for TMO surface analysis. An area that we have recently found productive is tailoring chemical and electronic TMO properties by the formation of solid solutions of two or more metal cations to form homogeneous, single-phase TMO systems over a wide range of cation concentrations. 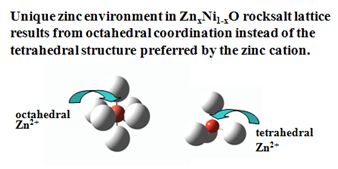 For example, rocksalt ZnxNi1-xO (0 ≤ x ≤ 0.325) places zinc into an octahedral lattice rather than the preferred tetrahedral coordination it adopts in ZnO. The substation changes fundamental properties of the NiO lattice, including antiferromagnetic Néel temperature, unit cell lattice parameter and chemical properties. It has a particularly dramatic effect on the Zn2+ cation. We are presently investigating this and other TMO solid solutions at the nano-scale to determine the effect of nanoparticle composition and particle size on the physical properties of the TMO material. 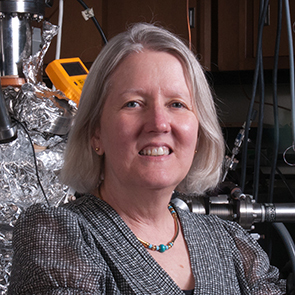 Researchers in the group are involved in a broad area of research, from synthesis and materials characterization to measurement of fundamental electronic, catalytic and materials properties to computational modeling of the bulk and surface properties. Students may declare either a physical chemistry or inorganic chemistry emphasis in their thesis and program of studies. For more information, please visit the Langell Research Group Homepage. (1) Metal structural environment in ZnxNi1-xO solid solutions by XAFS. Peck, Matthea A.; Langell, Marjorie A.. ABSTRACTS OF PAPERS OF THE AMERICAN CHEMICAL SOCIETY Volume: 246 Meeting Abstract: 648-INOR Published: SEP 8 2013. (2) XPS analysis of Fe3O4 nanoparticle: Surfactant interactions. Wilson, Daniel; Langell, Marjorie A.. ABSTRACTS OF PAPERS OF THE AMERICAN CHEMICAL SOCIETY Volume: 246 Meeting Abstract: 271-COLL Published: SEP 8 2013. (3) Characterization of Copper Palladium Oxide Solid Solutions by X-ray Diffraction, X-ray Photoelectron Spectroscopy, and Auger Electron Spectroscopy. Christensen, Gregory L.; Langell, Marjorie A.. JOURNAL OF PHYSICAL CHEMISTRY C Volume: 117 Issue: 14 Pages: 7039-7049 Published: APR 11 2013.